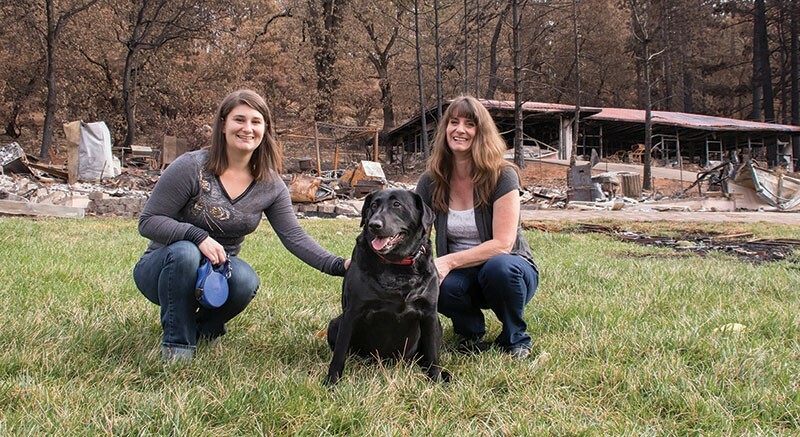 LUCKY DOG Although the Lofton family lost their Cobb home in the Valley Fire, their dog, Daisy, stayed healthy thanks to the Middletown Animal Hospital. It's been four months since the Valley Fire, but the need for assistance goes on. For the Middletown Animal Hospital, which became ground zero for domestic and large-animal rescue and care during the disaster, the road to recovery is ongoing. Dr. Jeff Smith and his staff continue to provide affordable and sometimes free care and services for families in the community affected by the fire. That's where HALTER comes in. Established by Glen Ellen–based event and project manager Julie Atwood in 2012, the Horse and Livestock Team Emergency Response (HALTER) focuses on creating a network of community members and first responders to help animals in emergencies, and provides information and resources for horse and livestock owners with a focus on preparedness. "We saw there was a need in the North Bay to help large animals and the people who own them in emergencies," Atwood says. "In the case of the Valley Fire, we got called in ways we never anticipated." HALTER's role in the Valley Fire first stemmed from a veterinarian at UC Davis who was a first responder in HALTER's network. He called Atwood to ask for support for the Middletown Animal Hospital. Though Atwood had never worked with the animal hospital, she took to the internet to start connecting the hospital with volunteers and began collecting donations on their behalf. HALTER's initial goal of $150,000 was quickly surpassed, though after a month's time, the donations plateaued. Atwood was looking for a way to bring in more funds to allow the hospital to continue offering animal services on a sliding scale. At the same time, Sonoma photographer and friend Melania Mahoney reached out to Atwood to offer her assistance. Together, they created the 2016 Year of Recovery monthly calendar, available now, to benefit the animal hospital by sharing stories and memories of families connected with the animal hospital. For Atwood, the project became more than a fundraising effort, resonating with her on a personal level she did not anticipate. "When we started, it was simply 'Let's support the animal hospital, let's raise money and keep this story out there,'" Atwood says. "It took on a life of its own. It became a very personal and emotional project." Atwood listened to hundreds of stories in her visits to Middletown Animal Hospital. "We feel a part of a community now that we never knew a few months ago." That community is reflected in the calendar's photos and interviews. Showcasing horses, sheep, goats, dogs, cats and even a 70-pound tortoise, the calendar is a yearlong reminder of the "importance of animals in our lives," Atwood says, "and of the importance of being prepared in an emergency." The 2016 Year of Recovery Calendar is available throughout the North Bay and online at halterfund.org. $20 plus $1 shipping. All proceeds go to the Middletown Animal Hospital.